Nassau, The Bahamas — Attorney General and Minister of Legal Affairs Allyson Maynard Gibson announced changes December 5 that will speed up the process of business formation in The Bahamas. The announcement was made at a press conference at the Office of the Attorney General. Processing business applications and collecting business tax revenue is one of the Bahamas Government’s Registrar General’s most frequent means of public income. The Attorney General’s Office is currently drafting amendments to the Companies Act and the IBC Act to create Schedule Companies. Named to the Companies Advisory Committee are: Damian Gomez, Jacinda Butler, Donna Smith, Felix Stubbs, Aliya Allen, Cherise Cox Nottage, Michelle Pindling Sands, Donna Lee Harding, Antoinette Russell, Robin Scavella, and Debi Williams. “This advisory committee comprises of a cadre of young and dynamic attorneys, accountants and practitioners in company registration,” said the Attorney General. She said they represent some of the most talented and brightest minds capable of competing with anyone in the world. The Attorney General’s Office has engaged IBM, which is the world’s leader in creating business systems to work with vendors and RGD teams. The technology magnet would advise the Bahamas Government on how to deliver companies within minutes. The AG’s office has also consulted the private sector and their support was indicated by the willingness of the committee members to volunteer their time to help bring into the RGD, 21st Century best practices. 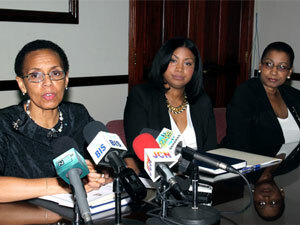 “We are all disturbed about The Bahamas’ ranking as 77th in the World Banks’ IFC Report on the ease of doing business. The Bahamas’ ranking as 77th is down eight points from last year’s rating as 71st. The details of the chart show that it takes 10 to 11 days to form a company. This is unacceptable. It is possible to form a company in minutes. The primary mandate of this committee is to advise the Attorney-General on ways for improving company registration thereby enhancing the ease for doing business in The Bahamas,” said AG Maynard Gibson. The Attorney General’s Office believes that the training will give a firsthand appreciation and sensitise Government employees in the Registrar General’s Office of the private sector demands and operations that time is of the essence and time is money for the business sector. The AG’s Office believes the turnaround time for doing business within The Bahamas will be reduced substantially. “IBM has indicated that with proper support, this project will be operational within six months,” said the Attorney General Maynard. Caption: The Bahamas Attorney General Allyson Maynard Gibson.